COVER: Ready for some backgammon? All you need is this book and a board! You don't even have to have an aopponent to replay the many live games and solve the specialized situation discussed here in detail. After all, you don't want to just read about backgammon but to play itand play it well. Winning Backgammon was written to bridge the gap between reading and actual experience, to get you started playing the game. And you will! 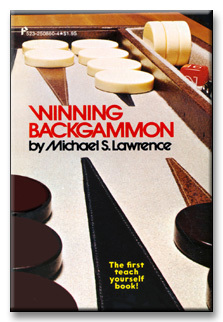 Michael Lawrence, who is a member of the U.S. Aces, a world-championship-winning bridge team, teaches both bridge and backgammon. This book is a skillful synthesis of his experience in playing backgammon and teaching it to others. For those entirely new to it, there is a general discussion of the game. Then there is a play section, a number of games between two players, who range in ability from fair to excellent. You will have a chance to play against both of them, to understand why each move was made! You'll learn by doing, then you can dazzle your live opponents with plays that might take others years to learn. Here it isthe mechanics of the game, the opening plays, early objectives, doubling and redoubling, and a thorough analysis of the middle and end games. For the first time ever, the strategies of the winning game are accessible to both the beginner and the frustrated loser.